PONTE VEDRA BEACH, Fla. – The 13th-ranked Arkansas men’s golf team recorded rounds of 286-293 for a day one total of 579 (+19) to stand in a tie for ninth at the Sea Best Invitational, played at the par 70, 6,858-yard TPC at Sawgrass – Dye’s Valley Course. The 14-team field features nine of the nation’s top 50 programs, including 36-hole leader and 46th-ranked Florida (278-281=559). The top five is rounded out by #23 North Florida (561), #26 NC State (564), #35 Liberty (568) and #39 Florida State (569). Mason Overstreet, William Buhl and Luis Garza are all tied for 21st at +3 (143). Overstreet, ranked #42 in the nation, shot an even-par 70 in the morning session with four birdies and four bogeys. In the afternoon, he also had four bogeys but just one birdie for a 3-over par 73. 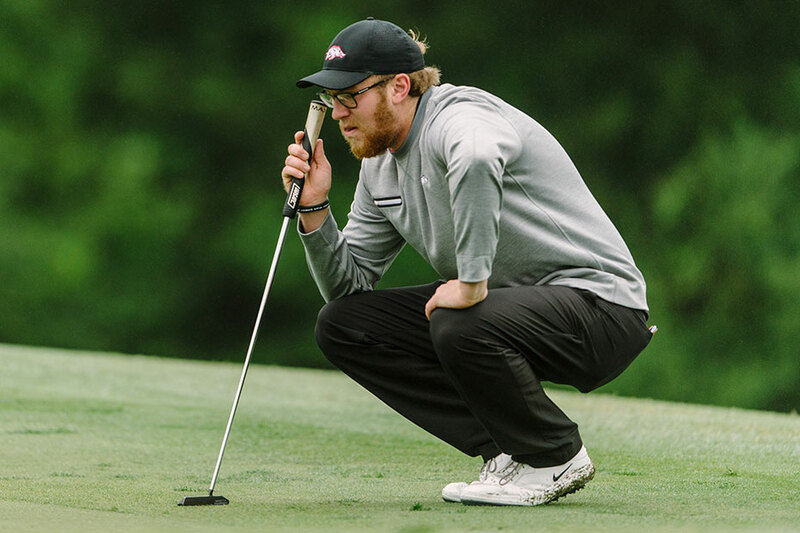 Buhl, ranked 83rd nationally, carded five birdies in the first round and finished with a 1-over 71 while turning in three birdies in round two for a 2-over 72. Garza had 14 pars in the first round and shot a 3-over 73 before making five birdies to post an even-par round of 70 in round two. Wil Gibson, playing as an individual, stands in a tie for 47th. The freshman jumped 25 spots after shooting a 78 in the morning by carding an even-par 70 in the afternoon for a 36-hole total of 148 (+8). Tyson Reeder is tied for 56th (72-78=150) and Julian Perico is tied for 63rd (73-78=152). The Sea Best Invitational will conclude with 18 holes on Tuesday (Feb. 5). For more information on Arkansas Men’s Golf, follow @RazorbackMGolf on Twitter.